This package is specific mainly for applications used in Iran . 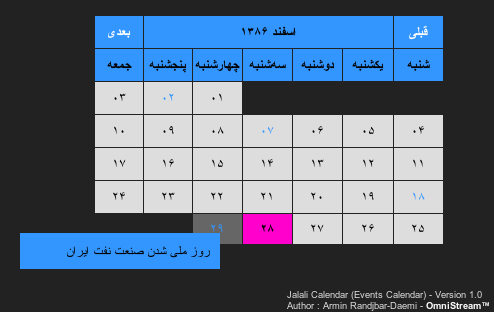 This package can be used to compute dates in the Jalali calendar. There is one class that can convert dates from the Gregorian to the Jalali calendar and vice-versa. Another class can determine the first day and the number of days of a given Jalali month. An add-on class can display tool tips to associated to page elements with more detail about calendar events.